Jim Lambert got up in the middle of the night five years ago in his Chelmsford home to use the bathroom and fell flat on the floor. A cascade of health problems ensued that were as a nightmarish as they were mysterious. The 72-year-old retired hospital fund-raiser lost his ability to walk in a straight line, and instead shuffled with an unsteady gait. He lost control of his bladder and bowels. An eloquent speaker and voracious reader, he suddenly couldn’t read or hold a conversation, and answered questions with short sentences. Lambert’s family physician diagnosed him with Alzheimer's disease and prescribed medication. Skeptical of the diagnosis, Lambert’s wife relentlessly sought second and third opinions: A neurologist also thought it was Alzheimer’s, and a psychotherapist disagreed with that diagnosis but was unsure what the problem was. Meanwhile, Lambert continued to decline. His wife, Terrie, who had been bathing and dressing him, developed serious health problems of her own, and was no longer able to care for him. Eventually unable to move, Lambert ended up in a nursing home, slumped most days in a wheelchair. But Terrie didn’t give up on her three-year odyssey searching for help for her husband and ultimately discovered a specialist at Brigham and Women’s Hospital who diagnosed Lambert with a little-known brain disorder, called normal pressure hydrocephalus. Known as NPH, it is believed to plague more than 300,000 Americans, many of whom don’t realize that the disorder’s hallmark symptoms — a distinct, wide-stance shuffling gait, dementia, and incontinence — can be treated and often reversed. Read: Is it normal pressure hydrocephalus? “It’s like I was reborn,” Jim Lambert, now 77, said in an interview, as he described the stunning reversal of most of his symptoms within days of treatment last year. He is back to reading his beloved military history books, chatting and joking, and mostly walking normally — only a bit unsteady on uneven ground, where he uses a cane. Terrie and Jim Lambert, who was diagnosed with Alzheimer’s, but was found to have a treatable brain disorder. Dr. Mark Johnson, the Brigham brain surgeon who treated Lambert, believes his patient’s experience is hardly unique. “I think there are a large number of patients out there who are suffering from gait instability, dementia, and incontinence who could be treated effectively if only the proper diagnosis could be made,” said Johnson, an associate neurosurgery professor at Harvard Medical School. Johnson directs a new center at the Brigham aimed at evaluating and treating patients with the disorder and conducting research to find better methods of diagnosis and treatment. Normal pressure hydrocephalus is believed to be caused by an excess accumulation of the liquid that normally circulates in a person’s brain and spinal cord. Johnson said that NPH usually occurs in older adults and is often undiagnosed or misdiagnosed as Alzheimer's or Parkinson’s disease, or simply “old age,” because the symptoms typically come on gradually and are similar to those found in other diseases often associated with aging. The condition can also develop in patients who have had a brain tumor, a brain infection, or head trauma. The Hydrocephalus Association estimates that 5 percent of people in the United States with dementia are misdiagnosed cases of NPH. Combined with the numbers of diagnosed patients, the association calculates there are about 375,000 cases in this country, a number that is expected to grow as the population ages. Patients diagnosed with NPH are typically treated with a device called a shunt that is implanted in their brain and helps drain the excess fluid, via a catheter, to their stomach, where it is reabsorbed. The catheter runs under a patient’s skin, down the neck and over the collarbone to the stomach. Exactly what causes NPH is unknown, something that gnaws at Johnson. Among those recently diagnosed is Susan Sontag, 70, who survived terminal brain cancer 19 years ago. After her recovery, she and her husband, Rick, a Florida businessman, started the Sontag Foundation to support brain cancer research. Then Susan Sontag started having trouble walking and memory problems. Her husband assumed it was the result of the cancer treatments, but the symptoms worsened. By coincidence, the Sontags sat next to Dr. Johnson at a Sontag Foundation dinner earlier this year — the foundation funded some of Johnson’s early brain cancer research. Johnson noticed Sontag’s symptoms and suggested she get tested for NPH. A brain scan suggested she had NPH, and doctors then slowly drained some fluid from her brain over several days. When a physical therapist asked Sontag, who was in a wheelchair, to try to stand up, she sprang up and started walking. Her husband was stunned. Grateful for her diagnosis and treatment — and convinced that many others are suffering needlessly — the Sontags donated $1 million to the Brigham to launch its hydrocephalus center. NPH was first described in medical literature in 1965, but many physicians apparently have never heard of it. That was the finding of a physician survey, published in 2008 in the Yale Journal of Biology and Medicine, by retired Yale University School of Medicine professor Harold Conn, who was diagnosed with the disorder in 2003. He had never heard of the disorder until then. Conn slowly developed symptoms of NPH from 1992 to 2002, and was misdiagnosed as having Parkinson’s disease. By the time he was correctly diagnosed, he was virtually unable to walk and had lost some short-term memory. After his recovery, Conn conducted a survey of 166 physicians, who graduated from 50 American and 33 foreign medical schools, and found that nearly a third had never heard of NPH. Dr. Daniele Rigamonti, a brain surgeon, researcher, and professor at Johns Hopkins Medical Institutions, said he has treated about 1,000 people for NPH over the past decade. A study of 132 of those patients published in the journal Neurosurgery found that 75 percent of those who received a shunt improved within two years of surgery. Gait improvement was the first and most likely response to surgery, Rigamonti found, while incontinence and dementia took longer and were less likely to improve. He also found that the longer patients suffered NPH symptoms, the less successful the surgery. Complications from surgery included over-draining from the shunt, infections and one death. Nine percent of patients who initially improved after surgery later deteriorated again, though the researchers could find no evidence the shunts malfunctioned. 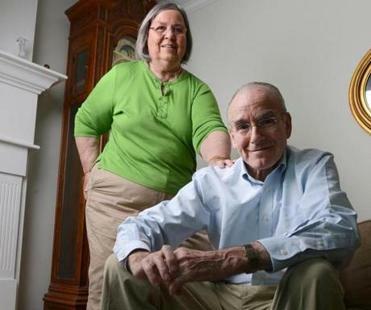 Jim Lambert, who lived in a netherworld for more than three years while suffering from NPH, thinks misdiagnosis is common because the disorder typically involves older adults who often have ailments that defy simple explanations, frustrating physicians. “They wanted to put me in a cupboard and forget about me,” he says of the physicians and specialists who misdiagnosed him.